The 1931-era B.B. Comer Bridge over the Tennessee River in Jackson County, Ala., could become the target of preservation efforts. Local bridge fans and state officials plan to meet this summer on ideas for saving the structure. In February, a group dedicated to the study of historic bridges added the span to its list of Top 10 savable bridges in the United States. To find information or show support for the old Highway 35 bridge, go to https://www.facebook.com/groups/123231444445454/ for the "Friends of the B.B. Comer Bridge" Facebook page. Photo by Laura McNutt /Times Free Press. SCOTTSBORO, Ala. - The B.B. Comer Bridge over the Tennessee River was named to a Top 10 list of savable bridges for 2013 and is the target of a preservation effort. The 1930s-era steel truss bridge was named to 2013's Top Rated Unique Savable Structures, or TRUSS, winners, according to bridgehunter.com. James Baughn, author of the TRUSS list and the website, says the old span on Alabama Highway 35 between Section and Scottsboro is the last of its kind built in the state. According to Baughn's information, the span is a cantilever through-truss design that currently carries eastbound traffic across the river while westbound traffic uses a "new" span alongside, completed in 1985. "Starting in 1927, the Alabama State Bridge Corporation built 15 memorial toll bridges across the state," Baughn states. "The B.B. Comer Bridge is the last remaining bridge from this era." He contends the bridge could be preserved as a pedestrian or bicycle feature rather than demolished as part of the ongoing replacement project. "Since the Tennessee River is a navigable waterway, it may not be realistic to save the whole bridge ... but some effort could still be made to save the southeastern approach spans as a walkway," he said. A Facebook campaign was launched and lists almost 3,000 friends who are attempting to gather support for preservation. Meanwhile, work on a $20 million, 1.4-mile-long westbound span beside the old bridge is estimated to be finished in the next 30 months, Alabama Department of Transportation spokeswoman Rebecca Leigh White said. "We are about two-thirds complete," White said. 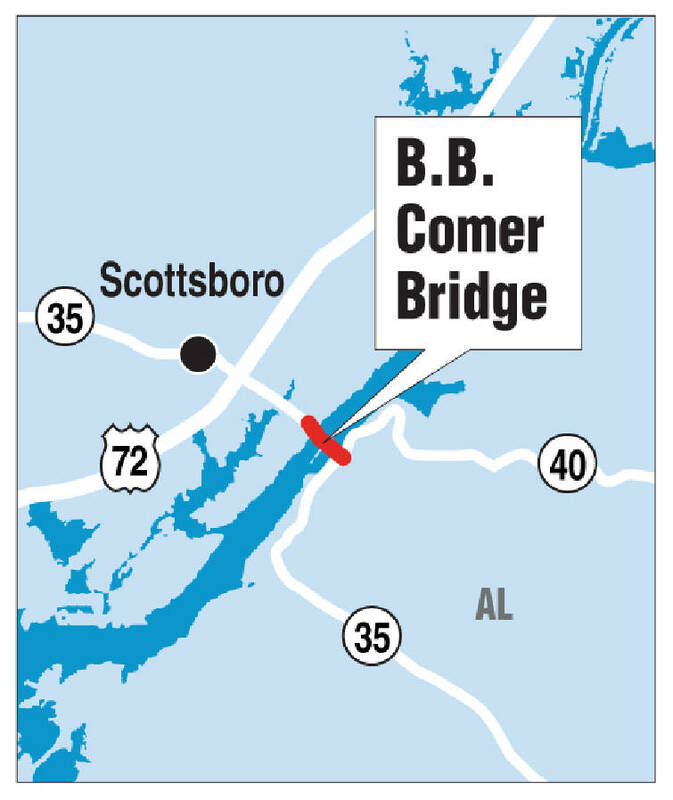 Jackson County Commission Chairman Matthew Hodges said the county and its seat of Scottsboro can't afford upkeep on the bridge, but officials and residents throughout Jackson County are fans of the old span. "Personally, I'd love to see it preserved," Hodges said Friday. Hodges, 29, grew up in Scottsboro and said the bridge has always been a welcoming sight when he returns home from a trip. "Those types of bridges are rare," he said. "It's just a beautiful view." Contact staff writer Ben Benton at bbenton@timesfreepress.com or 423-757-6569. Subscribe to his Facebook posts at facebook.com/ben.benton1 and follow him at twitter.com/BenBenton on Twitter.